Fast paced life and meeting deadlines can get any one of us all tired and exhausted. At times like these, aromatherapy essential oils can work wonders in helping you slow down, relax your senses, heal your body and elevate your moods. So just dim those lights, turn on some lounge music and add a few drops of your favorite essential oil to the diffuser. To help you pick the right aromatherapy essential oils, here’s our hand-picked list of the 10 Best Aromatherapy Essential Oils and Blends. Having therapeutic properties, this blend features the relaxing floral aroma of lavender and ylang ylang, peel oil of sweet orange, and the refreshing aroma of basil leaves. It helps in relaxing your mind, drives out negative thoughts and induces peaceful sleep reducing snoring. Buy This Now. This set of 6 aromatherapy essential oils harness earth’s natural healing powers. This set of essential oils contains Tea Tree Oil, Peppermint Oil, Lavender Essential Oil, Eucalyptus Oil, Lemongrass Oil and Sweet Orange Oil. Buy This Now. Packaged in a unique, quilted designer box, the six blends of essential oils are popular in aromatherapy. Made of more than thirty essential oils, these blends come in bottles named Energy, Serenity, Purification, Passion, Thievery and Organic Aromas Signature Blend. Buy This Now. The six oils – Eucalyptus, Lavender, Peppermint, Tea Tree, Orange & Lemongrass are known to help you rejuvenate and relax. These aromatherapy essential oils are 100% pure with no additives or preservatives. Buy This Now. This essential oil has the pure fragrance of an orchid. It has a strong scent of lilies and violet with a white musk base and with hints of orange, mandarin and rose. Buy This Now. A blend of cardamom, lavender, chamomile, mint, patchouli, valerian and vetiver, this essential oil invigorates and energizes your body, mind and soul. Buy This Now. This essential oil gives out a soothing smell of the woodsy camphor. It has shown great results when used for respiratory problems, in fact being almost as effective as Vicks Vapor Rub. And if you are prone to inflammation, muscular aches and pains, coughs, colds, fever and flu, this oil is for you. Buy This Now. 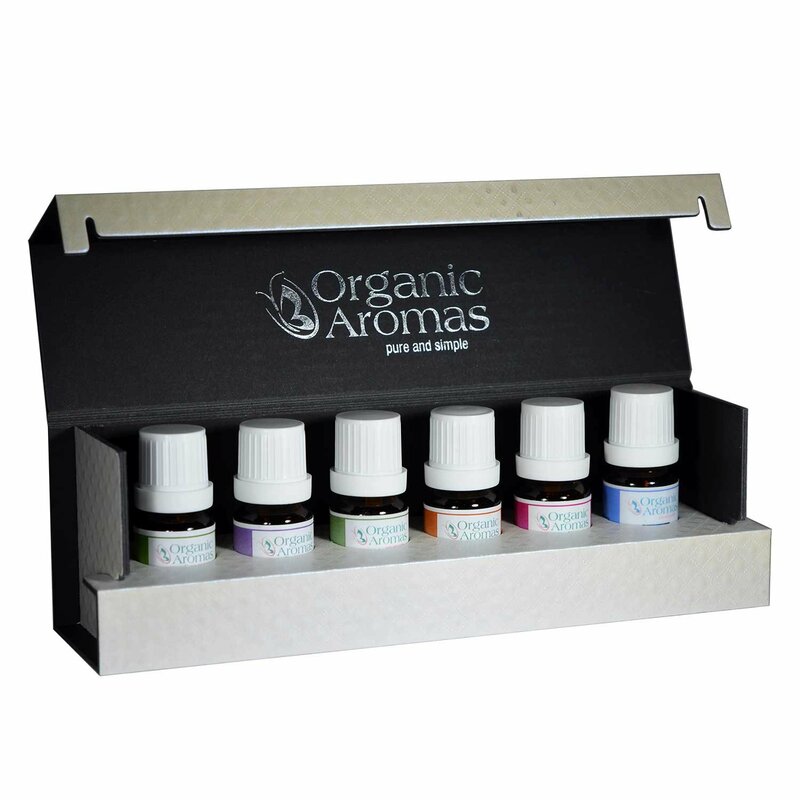 This set of 6 aromatherapy essential oils is made from citrus extracts. These essential oils help induce positivity, happiness, calmness and harmony. Citrus also helps you to relax, relieve anxiety, lose weight and acts as an antidepressant. Buy This Now. Natural flower oils with their beautiful fragrances are what make Red Silk Essentials flower essential oil kit unique. Each of the 6 essential oils bring their unique benefits to the aromatherapy experience. Buy This Now. If the rain smell or sea breeze are enough to elevate your mood, then this one is definitely for you. This is a set of authentic, earthy and woodsy aromatic essential oils in 6 different fragrances – Forest Pine, Ocean Breeze, Rain, Fresh Cut Grass, Sandalwood and Bamboo. Buy This Now.